iPhone 5 Announcement At T-Mobile “All Hands Day” Meeting On September 24th? According to a recent post by TmoNews, new evidence has emerged speculating a possible release date for iPhone 5. As published by 9to5Mac, the source has received a big number of emails mentioning that T-Mobile has called an “All Hands Day” meeting for September 24th for some unknown reason. However, since that date falls on Saturday, it is not possible for Apple to hold any media event. Also, it is highly likely that T-Mobile could simply be gearing up for some other big non-Apple related product such as a Samsung Galaxy S II. As noted by BGR, the memo could simply not be for an iPhone 5 launch because it is not at all expected to hit the stores before October. 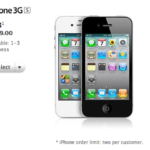 It is worth mentioning here that Deutsche Telekom, the parent company of T-Mobile USA is already taking iPhone 5 pre-orders. Could there be a possible connection here?